Originally printed in our Last Minute Patchwork Gifts book, our gorgeous Color-Wheel Quilt Pattern is now available all on its own! It includes step-by-step instructions, plus the templates you'll need to sew up your own super fun trip around the spectrum. If you love this quilt in Liberty of London prints as much as we do, be sure to also pick up all 52 fat quarters with our Liberty Color-Wheel Quilt Bundle. For more information, including a list of materials you'll need, please click Product Details, above! Color-Wheel Fabric: 52 different-color cottons, at least 4 x 12 inches each. 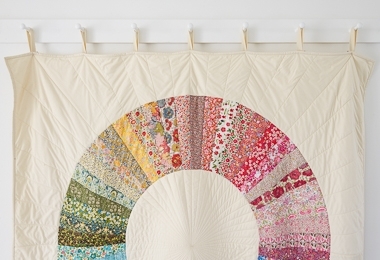 We used Purl Soho's Liberty Color-Wheel Quilt Bundle. Our spectacular Liberty Color-Wheel Quilt Bundle includes 52 hand-selected fat sixteenths (approximately 9 x 12 inches) from Liberty of London's gorgeous Tana Lawn collections. The prints are specially chosen to flow through the entire rainbow in perfect harmony! To make the complete quilt you will also need 7 1/4 yards of a solid fabric of your choice. Please note: Prints may be substituted but will always be beautiful!